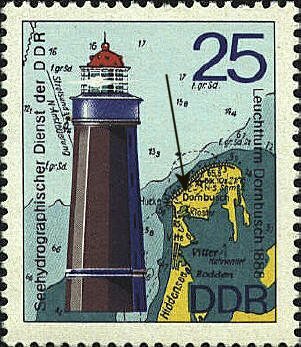 This stamps pictures the Dornbusch Lighthouse which was commissioned in 1888 and stands 23 meters high. It stands of the morraine at "Dornenbusch" on the Isle of Hiddensee in the Baltic Sea. On the map "Dornbusch" is misspelled "Dombusch." Another possible error might be the name given to the lighthouse on the left side of the stamp. According to one source the correct name is "Leuchtfeuer Dornbusch" rather than "Leuchtturm Dornbusch."